Like living fairies, butterflies flutter across flowery meadows on beautiful wings. But put aside your fairy fantasies for a moment and consider that some butterflies drink tears, eat poop, wear false heads, and kill to survive. Here’s a little peek into the darker world of butterflies. 1. THEY EAT POOP AND DRINK TEARS. Butterflies don’t just drink nectar from flowers. Many of them consume a whole host of revolting things, from poop to urine to decaying animal flesh. They’ll even drink the tears of reptiles to get some much-needed sodium. Scientists can use these less savory preferences to attract and study butterflies: Researchers trying to attract tropical Skippers will spit on a piece of tissue and put it on the ground, a method known as the Ahrenholz technique [PDF]. Butterflies are attracted to the saliva-soaked tissue because it looks like bird poop, and they stick around because it provides them with sodium and other nutrients. Meanwhile, their presence allows scientists to photograph and collect them. 2. SOME OF THEM ARE CARNIVORES. Don’t worry, you can visit your garden without risking attack from a swarm of predatory butterflies. But some caterpillars kill for a living. Take the ominously named harvester: This North American butterfly lays its eggs on colonies of woolly aphids, and the caterpillars grow up snacking on the aphids, sometimes protecting themselves with the corpses of their victims. Then there’s the moth butterfly of Asia and Australia. Protected by tough outer shells, its caterpillars live in ant nests and eat their larvae. But when the caterpillars become butterflies, they’re suddenly soft and vulnerable. They beat a hasty retreat, shedding extra wing scales that stick to their ant pursuers. 3. THEY CAN BE REALLY, REALLY PICKY EATERS. Say you want to help butterflies, so you plant a beautiful garden full of flowers. Soon, butterflies of all kinds are fluttering around the blossoms. Success! But wait—if you don’t have exactly the right plants, those butterflies won’t have babies. They’ll be genetic dead ends. That’s because some butterfly caterpillars can only eat the leaves of one plant, or one small group of plants. The Karner blue caterpillar, for example, chows down on just one species: wild blue lupine. The monarch butterfly caterpillar eats only the members of a group of plants called the milkweeds. The Hessel’s hairstreak consumes Atlantic white cedar, which often grows in threatened wetlands. A caterpillar’s food plants are called host plants—they’re the only species that can host the right dinner party for a growing caterpillar. Once the caterpillars turn to butterflies, they may visit many different plants and drink their nectar. But if they don’t eventually find the right host plants, they can’t have babies, because the female caterpillars will only lay eggs on plants that can serve as hosts. 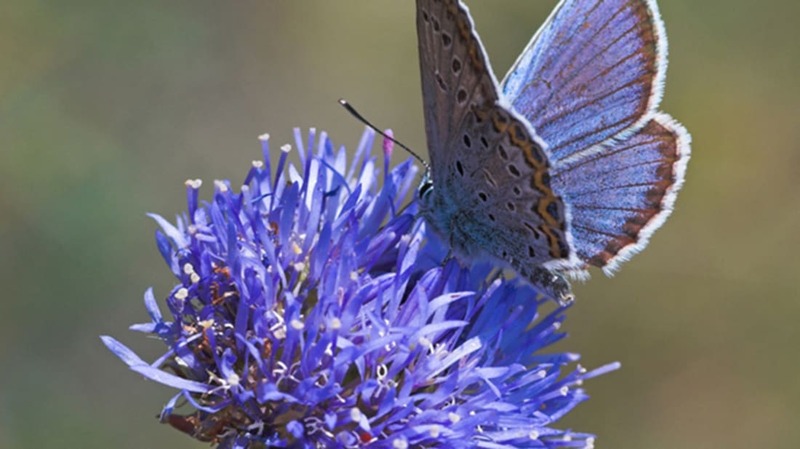 To thrive, butterflies need access to both delicious nectar sources and host plants. 4. THEY USE ANTS AS BABYSITTERS. Many members of a butterfly family called the Lycaenids, or gossamer-wings, rely on ants to take care of their babies. The caterpillars use special chemicals to attract ants. In some species, such as the Alcon blue, those ants carry the babies back to their nest, and vigorously protect them from parasites, sometimes at the expense of their own kind. This isn’t always an ideal arrangement for the ants—the caterpillars may provide nutrients, but some of them will snack on ant larvae. To fight back, some ants slowly alter their communication chemicals over time so that they no longer match the caterpillar’s signals—effectively changing the locks on their home. The caterpillars must evolve and keep up or risk being ignored completely. Once they become adults, the relationship can get even more twisted. One species of butterfly, Adeloptypa annulifera, uses ant babysitters, and once it grows up, it steals food from those same ants. It even looks a lot like an ant. Sneaky. 5. SOME ARE A FOOT LONG. Butterflies can get pretty big. Some Queen Alexandra's birdwing butterflies have a foot-long wingspan. In contrast, the western pygmy blue has a maximum wingspan of about three-quarters of an inch. Perched on a human finger, it looks ridiculously tiny, even when spreading its wings to their full glorious extent. 6. SOME BUTTERFLIES ARE NOT COLORFUL. Butterflies come in a rainbow of hues. But some of them have such understated colors that you might think they’re moths. Plenty of butterflies are gray or brown. The gray hairstreak is, well, gray. Arctic butterflies, such as this Jutta arctic, are speckled brown, and are capable of living in remote cold places such as the tundra. The evocatively named dreamy duskywing is also totally brown. Their patterns are lovely if you’re a fan of earth tones. But the ultimate colorless butterflies are just see-through. Really. The wings of some species, such as the glasswinged butterfly, have minute structural characteristics that cause light to pass right through them. 7. SOME HAVE COLORS WE CAN’T SEE. Butterflies look at the world in a totally different way than we do. Their eyes aren't adapted to see as many fine details as we can. On the other hand, they can perceive colors outside of our visual range, such as ultraviolet. Many of them make ultraviolet pigments in their wings—so they have patterns that are invisible to human eyes. They may use them to help find the right mate. 8. THEY USE FALSE HEADS TO TRICK PREDATORS. So how can a butterfly encourage a predator to bite its wings and not its head? Some species have false heads on their wings, right next to their butts. These fake heads are a tempting target for spiders and other hunters—especially when a butterfly points its fake head up and wiggles the “antennae.” The predator bites the false head, and the butterfly escapes with its real noggin intact, able to fly another day. 9. THEY STEAL AND USE POISONS. Their heads aren’t the only weapons that butterflies wield. Some caterpillars absorb poisons from their food plants and use them against predators. Monarch butterflies, for example, collect milkweed toxins to make themselves less tasty to birds. And remember those foot-wide Queen Alexandra’s birdwings? They use the same tactic by munching on a particular toxic vine. 10. SWALLOWTAIL BUTTERFLIES MAKE A STINK. And here’s another weapon. 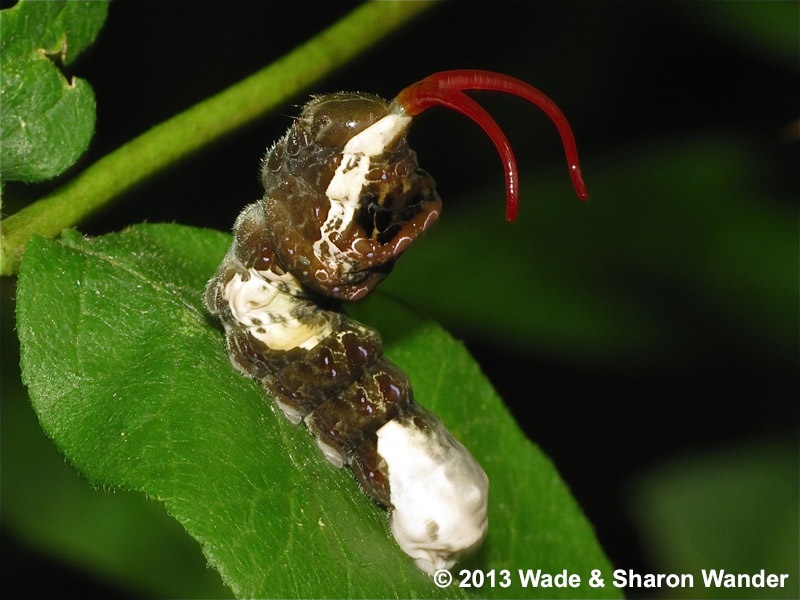 When swallowtail butterfly caterpillars are threatened, they stick out a colorful stinky organ called an osmeterium. It looks a little like a snake’s tongue and serves to make them seem a lot less tasty to other insects. If you play video games, this might sound familiar: The swallowtail's defensive practice inspired the Pokémon Caterpie, which has a permanently visible osmeterium and defends itself with a powerful odor. All photos via iStock except where noted.